"He must die, Mr. Thorn!" We all know that some kids can be like the devil, but in the case of Gregory Peck and Lee Remick in this 1976 horror classic (man, I hate to use that overused word but it really applies here) their kid actually is the Devil. Well, the son of, technically. Of course they don't know that�at least not right away�and actually the young boy named Damien (Harvey Stephens) isn't really their biological child. In a case of "when in Rome, don't do what the Romans do," it seems American diplomat dad-to-be Robert Thorn (Peck) is coerced into agreeing to accept the just-born infant after wife Katherine Thorn (Remick) loses their baby during childbirth in a Rome hospital. Raising the Antichrist is apparently a monumentally tough gig, and under the guidance of director Richard Donner�in what was essentially his first major feature film before things like Superman and the Lethal Weapon series�the parental pitfalls reach increasingly nasty proportions as warnings are given, people die (including a mighty fine decapitation scene) and poor Gregory Peck has to eventually come to terms with what must be done to save the world. This new two-disc collector's edition sports an improved transfer, making Donner's film look far better than it ever has before, and all of the mounting tension plays as well and looks just as good today as it did in 1976. Sure, part of the re-release is no doubt a marketing flash to cash in on the bigscreen remake (which is, by the way, a sacrilege), but the improvements made on the transfer make this worth the double dip if you already own the single-disc special edition. The trouble with too many horror films, especially those made in the 1970s, is that they rarely stand up to the so-called test of time, and often become jokey "this is what passed for scary back then" exercises when shown to modern-day jaded viewers. But Donner's direction of the David Seltzer (Prophecy, Lucas) screenplay operates just outside the usual umbrella of purely effects-driven horror, and with actors the caliber of Peck and David Warner, there is plenty of room for great somber emoting that is well above typical genre stuff, and the comparatively modest effects pieces work well under a story that builds supernatural tension with things like menacing dogs, and nannies that like to hang themselves at children's birthday parties. I never put much stock in the assorted sequels that followed in the years after The Omen, because there was never really anything amongst the assorted followups that could come close to uncorking the same level of well-crafted horror, literally dripping with dark, apocalyptic religious themes. 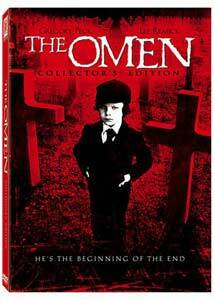 For a mainstream Hollywood feature, Donner birthed a bona fide classic�there's that damn word again�with The Omen; for it to be able to retain the same bristly satanic suspense, even in this era of more refined and elaborate effects-driven pictures, is really saying something. Image Transfer Review: As with the previously released SE, The Omen comes issued in 2.35:1 anamorphic widescreen, but the really good news is the transfer has undergone a remastering that dramatically improves on the earlier version. Doing a side-by-side comparison between the two reveals substantially more natural coloring in fleshtones with this new transfer, and gone are the red hues so unnaturally dominant on the SE. Some grain is evident, but the print itself is in particularly decent shape, and the color rendering and depth of black levels hold up exceptionally well throughout. Audio Transfer Review: The original English 1.0 mono track is included here (as well as French and Spanish dubs), and it still provides clear dialogue at all times, akin to the way some of us heard this during its 1976 theatrical run. Gone is the remixed stereo track found on the previously released SE, and in its place is a nicely done new Dolby Digital 5.1 surround mix. Dressing up mono recordings in 5.1 is an iffy proposition in my book, but thankfully this new mix doesn't try to over do things, nor do things end sounding too artificially forced. The soundstage does get expanded a bit in 5.1, but it's a still a mono presentation at heart, and that's really where it sounds best. Disc 1 carries two commentaries, both featuring director Richard Donner, and considering how effusive and chatty the guy always is, both tracks really have their own merits. The first appeared on the SE release, and pairs the director with editor Stuart Baird, and aside a few dead air spots, the two have interesting remembrances of things like who set up a light rig for a certain shot or various intricacies of the eight-week shoot, as well as how much Jerry Goldsmith earned for his score. I've always considered Donner a great interview, and he's rarely without anything to say, even if he almost admits to temporarily forgetting about the big "nanny hangs herself" scene. Really, Richard. The new track hooks Donner up with writer/director pal Brian Helgeland (A Knight's Tale, The Order), who seems to be along for the ride simply as a fan of The Omen. Donner and Helgeland have nice rapport, and while this track also has a few dead spots, the two do share a great story about camera lens' and the supernatural. The level of content is a little lighter than the original Donner/Baird track, and not always specific to the film, but it's a nice complement to the other track, and it's almost like two knowledgeable fans comparing notes. Disc 1 concludes with a theatrical trailer, plus a couple of other items imported from the SE, in the form of Curse or Coincidence? (06m:21s), which looks at the supposed real curse and "incidents" surrounding the production, and if producer Harvey Bernhard is to be believed, "The devil didn't want the picture to be made!" The four part, Jerry Goldsmith on The Omen Score (17m:36s) has the composer addressing how he came to write elements of the Academy Award-winning score, and how the role of music is to "push the film." Over on Disc 2 a few other new things show up, including Introduction by Director Richard Donner (01m:57s) where he gives a quick overview of the project, a dog attack deleted scene (01m:28s) with commentary from Donner and Brian Helgeland, Screenwriter's Notebook (14m:51s) with David Seltzer giving his recollections of how he came to write the screenplay (he needed the money) and the somewhat frothy but genuine An Appreciation: Wes Craven on The Omen (20m:16s), with one big name heaping well-deserved adoration on another. Recycled from the previous SE, 666: The Omen Revealed (46m:16s) is, in and of itself, a decent EPK, but the heavy-duty brand new whopper comes via The Omen Legacy (01h:41m:34s), originally shown on AMC. This full-length look at the entire series that was "ripped from the pages of The Bible" spends plenty of time on the so-called Omen curse, among others subjects. This is a solid, comprehensive look at the series, and aside from the joy of the Donner commentaries, the best thing here. Disc 2 concludes with a modest gallery of assorted production photos. The feature, on Disc 1, is cut into 26 chapters, with optional subtitles in English or Spanish. This new two-disc set repeats some of the same extras found on the last SE, but the transfer has really been improved upon and the highlight of the new supplements is another Donner commentary and the 101 minute The Omen Legacy doc. The Omen�made all the way back in 1976�holds up exceptionally well as one genuinely scary mainstream Hollywood horror film, and even though the flow of the sequels never quite had the same spooky magic, this one delivers every time.